In the vintage muscle car world a vehicle usually only needs one or two rare options to make it an expensive rarity. In the case of this 1972 Pontiac LeMans GT it’s definitely a rarity, but with the added bonus of still being relatively affordable. The LeMans GT package was only available in 1972 aimed at the more budget minded muscle car enthusiasts. This included a chrome bumper instead of the GTO Endura bumper and bench seats instead of bucket versions. The GT also included side tape stripes, dual exhaust, Rally II wheels and color coded mirrors with passenger remote. The standout option on this car is the Carolina Blue paintwork. The color was a special order from only a few Pontiac dealers in North Carolina who ordered the car as a tribute to the NCAA North Carolina Tar Heels. The ducktail rear spoiler was also special ordered and not a factory option. Apparently, Carolina Blue was also specially ordered on some Chevrolet models. After a bit of sniffing around online, it seems that the same vehicle as featured here has popped up for sale a few times, most notably from Mecum and from an independent car dealer. Both listings say the car is 1 of 1 with one of the listings saying it has PHS documentation to prove its authenticity. One listing showing the selling price for $32,000. 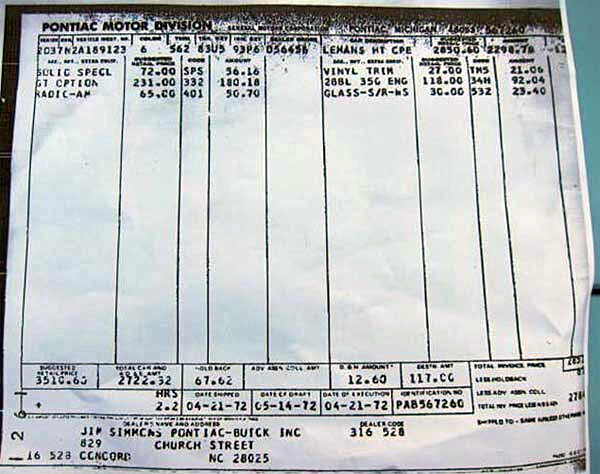 Not a huge amount more than what you would pay for a regular 1972 Pontiac LeMans GT. So, onto the individual details about this car. It was originally sold from Jim Simmons Pontiac Buick Inc., 829 Church Street, Concord, North Carolina. The schedule build date was the third week of April, shipped on the April 24, 1972. The options included – Solic Special $72.00, GT option $231.00, AM Radio $65.00, Vinyl Trim $27.00, 350-2 Bbl engine $118.00, Soft Ray Windshield $30.00. Total retail price being $3,510.65. 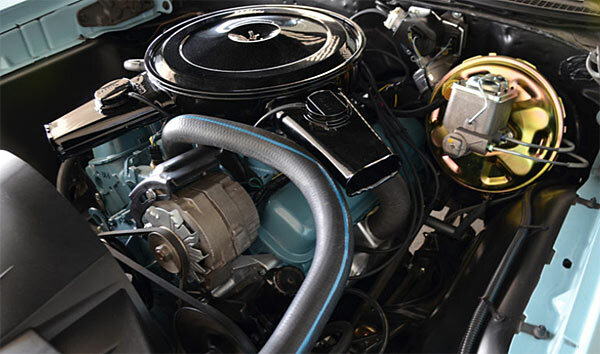 The car was restored in March 2014 by Muscle Car Designs, Joliet, Illinois at 40,000 miles, who replaced the original 350ci. V8 with a 455ci. V8 and a Muncie wide ratio 4 speed. Power steering and front disc brakes were also added. The two spoke steering wheel was also replaced with a three spoke wooden rim version. The ducktail spoiler is also a super rarity as it never made it into production due to problems with the mold. It’s a shame the original powertrain isn’t with the car, but the vehicle is definitely a fascinating rarity from the classic muscle car era.